Distinguishing Characteristics Hispanic female. Black hair, brown eyes. Marta was born in Guatemala. 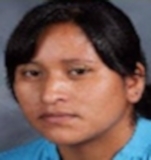 Marta disappeared from Heflin, Alabama on September 30, 2013. She was last seen at her home on U.S. 431 in the Hollis Crossroads area at 4:20 a.m.
At the time of her disappearance, she lived with her sister, her brother-in-law and their children and was a student at Cleburne County High School. Her family realized she was missing after she didn't return from school that afternoon. Authorities believe she left of her own accord. After Marta's disappearance, an unidentified man called her sister and brother-in-law's home multiple times to say she was still in Alabama, then in the Atlanta, Georgia area, and then in Maryland. The number he was calling from has since been disconnected and authorities were unable to identify him or verify his statements. Prior to her disappearance, Marta had spoken about returning to Guatemala, where she was born and where most of her family lives. She left a note behind saying this was her destination, but her sister and brother-in-law don't believe she could have gone there because they hadn't let her get a job and so she had no money. Her case remains unsolved. Updated 2 times since October 12, 2004. Last updated June 23, 2017; age-progression added.